Jude's VBS teacher, "Everyone line up. It's time to go hear Mrs. Bailey read to us!" Jude, "But I thought my mommy was reading to us." We just finished part 2 of Pilgrims Progress VBS. It went smooth and wonderful! Pilgrims Progress makes such a great VBS. The lessons taught through the story are life lessons for any believer! I would encourage anyone who hasn't read it to read it. 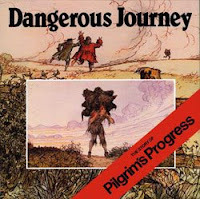 We used Dangerous Journey (the story of Pilgrim's Progress) revised by Eerdmans because the origional 1676 John Bunyon version is very difficult to understand because it was written so long ago. Even Eerdman's version uses words hard for young children to understand, so I revised it even more. To briefly highlight a little bit of the story, Christian has a burden and lives in the City of Destruction. The book that he's reading tells him that his city will be destroyed and he wants to know what he must do to be saved. No one else sees the danger or has a burden. 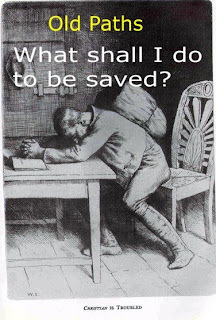 His family and friends don't want him to leave, but Evangelist tells him to go to the wicket gate and there, he will discover how to be saved. He tells him not to leave the path, the Kings Highway. Through the wicket gate, he walks between the walls of salvation up to a cross where his burden rolls off into a tomb. The Shining ones appear an give him new clothes and a parchment which he must not loose or give away until he reaches the Celestial City. In the story, he makes wise and unwise decisions. Sometimes he leaves the path, and sometimes he is wise and doesn't. At one point, he must go through Vanity Fair, a fair that never closes and was put up by Apollyon, the prince of demons, in the town of Vanity. He put it there because he saw that all pilgrims must go through this city on their way to the Celestial City. He put it there to tempt them to love the things of this world more than the King. Christian must fight Appollyon at one point as well. Another chapter is about Christian veering off the path, when he is weary and despairing, to Doubting Castle where he it tortured by Giant Despair until he remembers his Promise key which he uses to unlock the dungeon door and escape. In the end, he is received in the Celestial City with trumpets and angels because he has his parchment paper with him which shows that he was invited and came on the right road through the wicket gate. The story allowed each day to have different themes and characters, which made it exciting for songs and crafts and games and Bible verses. We had a wonderful time. So even though Jude didn't know who 'Mrs. Bailey' was, hopefully he learned a few lesson about the christian life!